Ah. I had this card come up recently, Temperance inverted, as take-home/dixiblog/domains/afoolsjourney.com/public_html message in a reading. Told her that she cannot mix the fire and water, meaning she couldn’t make the other person come ‘round. She’ll have to get by without requiring that blending of minds, meeting of objectives. And always with inverted Temperance, watch the firewater as well. It shows a tendency for drinking to get out of hand. Stone-cold sober is the way to go if this card is showing up for you! What are you having difficulty reconciling? It can be anything. Openness versus self protection, me versus you, needs versus wants, work versus play are but a few possibilities. Some things cannot or should not be reconciled. That is something to consider. Some people, some circumstances, will tend to knock you off your game. Some attachments don’t belong in a healthy life. I guess the first question is, “Do I even WANT to integrate this? Is it something that is worthy of becoming part of my identity? Does this fit into my world?” We’ve had a lot of Swords lately, you know. If it is an integration that’s desirable, then what’s throwing it off kilter (inverting the card)? That’s the next question. That’s what you address to get this energy upright, free-flowing. What isn’t mixing in your life? 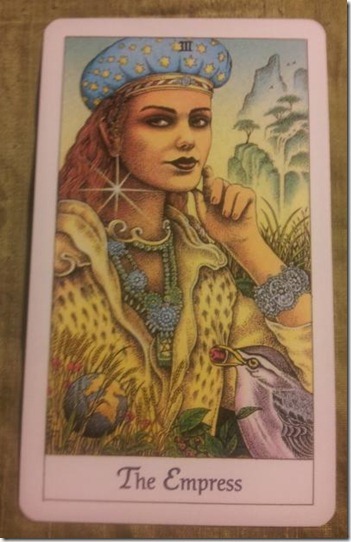 I was complaining about the Empress showing up in these daily draws…of course, that is exactly how the cards work. And if you’re writing a column, or doing a Tarot journal, or doing a draw on a regular basis for any reason, you’ll find the same thing. Some cards show up so frequently, it’s almost like being haunted. Hunted? Maybe you have no idea what it means. Or maybe you think you know exactly what it means. Whatever you think you know, don’t be overly sure. The same goes for whatever you think you don’t know. Mother is home/dixiblog/domains/afoolsjourney.com/public_html! The Empress is ruled by Venus. She’s the Tarot Mama, with all that entails. She’s perpetually pregnant, and her magic powers of creativity are what transform whatever she touches into abundance. I think she’s here now to nudge me into higher levels creative freedom. On my radar lately, I’ve been getting pings about living out loud, with an authentic voice as route to professional (and personal) growth. That takes some guts, if you want to know the truth. But then again, being perpetually pregnant takes some guts, too. Nobody said it was an easy job, being the Empress! Are you feeling the Empress? The Major Arcana (Cards 0-22) represent the bigger mysteries–the greater truths, the universal laws, the energetic and spiritual realities. The mythic Fool’s journey of the Majors outlines the transformational process. Whether you call it self-actualization enlightenment or awakening or whatever doesn’t matter a whit. Many schools of thought have many names for this process, but it’s at core a process of evolution. The Minor Arcana (Suit cards) illustrate the mundane, everyday world representations of wherever we are in the Major Arcana’s cycle. This is how the energy of above manifests below, sometimes in the form of lessons. In questions of timing, I usually find Majors to point to months or occasionally years, whereas the Minors speak more often to days or weeks. In general, the Majors just have a bigger and further reaching punch than the Minors. If the Tarot layout is chock-full of Major Arcana, you know this is a very important time with far-reaching impact. Crossroads and turning points are punctuated with the Majors. If the layout is mostly Minor Arcana, know the current focus is on refining and integrating what you already know. Individual choices tend to carry less weight, and impact is more temporary. It doesn’t mean the topic isn’t important. Only that current concerns are less pivotal in development. As every part of life has ebbs and flows, so does the cycle of growth. Thank goodness! That “growth thing” can be very demanding sometimes. The preponderance of Majors versus Minors will give you a pretty good idea of where you’re at. What do you find true of the Major versus Minor Arcana? Almost. What’s weighing you down, keeping you from achieving? Is it the stuff you keep under your bed? What old energy hides in the corner of your closet? Is it the story you tell yourself? Does it even fit? Whatever is holding you back, I’m betting it’s a lot less than you may think. Is there something that you can free yourself of, to set your world aright? Oh, Tarot is such a cut-up! Yesterday, we got the Mars card. Today, we’ve got the Virgo card. Mars insists on going first, of course. Mars just went direct in Virgo. Virgo power! So let’s put it to good use, since Virgo’s got extra gas. The Hermit keeps his solitary peace because his journey is ultimately inward. He seeks, studies and looks to understand, and can because he removes himself from distraction. His brand of solitude is not necessarily how we’d want to live our entire lives, but there at times when it’s called for. However, even if he’s not literally holed up on his own, he may be intellectually or emotionally withdrawn. You’ll see him appear upright when you’re in a period of self-reflection, or perhaps you should be! He tells you the answers you’re looking for are not about anybody else, as much as you may think to the contrary. The Hermit is all about YOU. Not what anybody said or did or deserves or thinks or whatever. Irrelevant to the Hermit. His question is the same: What does this mean to ME? For me? About me? Look inside. I think of Tarot this way, myself. Much like the Hermit. All roads inevitably lead back home/dixiblog/domains/afoolsjourney.com/public_html. You doing any soul searching? Ok. My floor freezer just died—so I was fishing mushy meatballs out of ice water. That’s every bit as much fun as it sounds. And I’m never happy to see a watery mess—then tend to show up around me before emotional blowouts. “At least it’s contained,” I think. “So maybe the emotions will be contained.” I’m not kidding here. I really do think like this. I pulled a card from my Witches pack on the Yule/Winter solstice after cleaning out the freezers. Great. More melting ice. Sit down to write today’s column and what do I see but reminder the God of War is back on the job? I’ve been bitching about Mars retrograde—in my native Virgo, it’s had me feeling like I’m frozen stiff. Right on cue, Mars is showing up to melt the glaciers. We have the Emperor (Aries) in all his testosterone-laden glory. Stag-horned God, he is. He’s also not much of a talker, in case you haven’t noticed. He’s more about action. Mars in Virgo is direct now, and the Emperor is her to remind us to get moving. Especially, tend to health concerns, matters of service, work, and doing what you said you would. Because integrity is always a good plan. Fight for right! Are you feeling moved to take action?